My first 2012 personal UFO challenge project is finished. I'm not positive, but I think that the completed quilt top awaited batting and backing for well over a year and a half. I am not certain why I placed this item on the back burner, a position usually reserved for something that is not quite coming together. 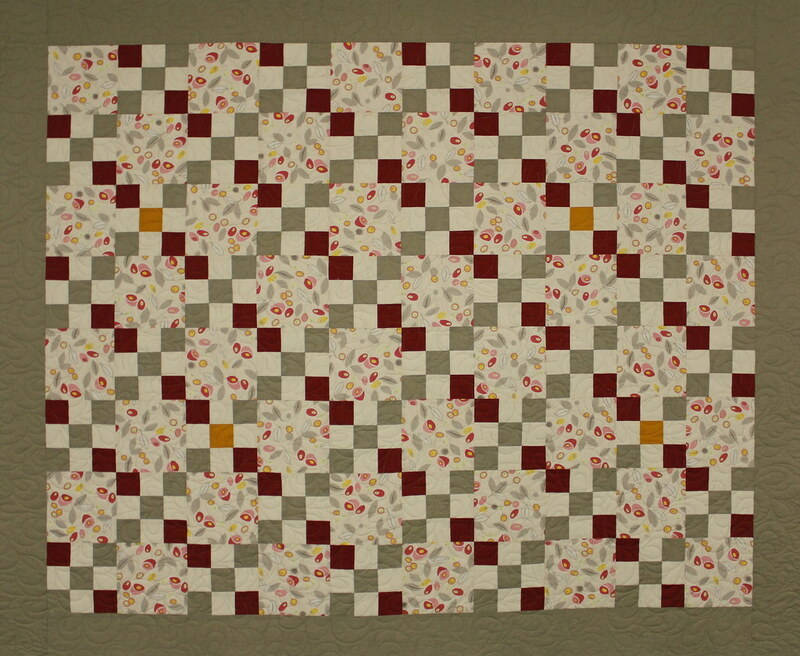 I was pleased with the top and now that it has been fully assembled, I am also pleased with the finished quilt. This is a simple, solid nine patch pattern, mixed with print squares, each measuring 6" x 6". The red and gray fabrics are from Moda's French General line. The nine patches were placed in an Irish Chain formation and an occasional "yellow zinger" was introduced. 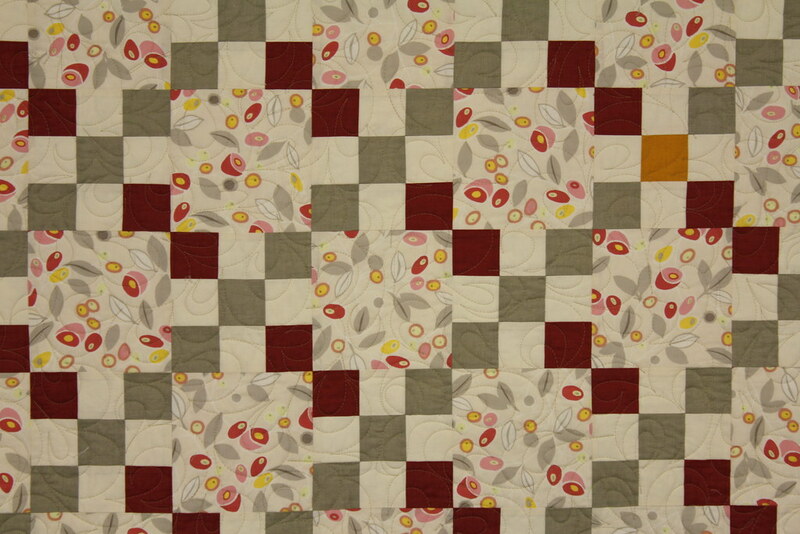 Again, the chestnut pattern was used for the quilting, in a light grey colored thread. I have become completely comfortable with this free motion pattern and am ready to move on to another technique. The back was made with two pieces of wholecloth; the print and the gray French General. 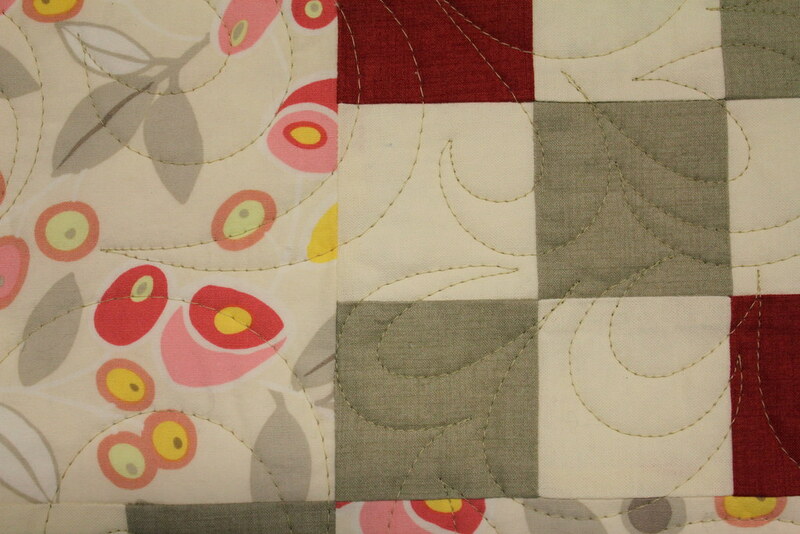 The later was manufactured with an adorable border printed at the salvage, which I preserved for this quilt. Now, the question: do I move on to UFO #2 or do I start something new? What would you do? Love it! Do you remember what the printed fabric is? Thank you Margie. Unfortunately, I do not know the name of the printed fabric. I bought it a couple of years ago at a local quilt shop and I do not have a shred or a salvage remaining. I think that it might be Japanese although I am not positive about that. I looked quite a bit on line as well but came up with nothing. If I run into it again, I'll be sure to pass the information along. So cute! Love the way the red blocks run 1 way and the grey blocks another. I LOVE THIS ONE TOO! Do you do your own quilting? It is beautiful!! 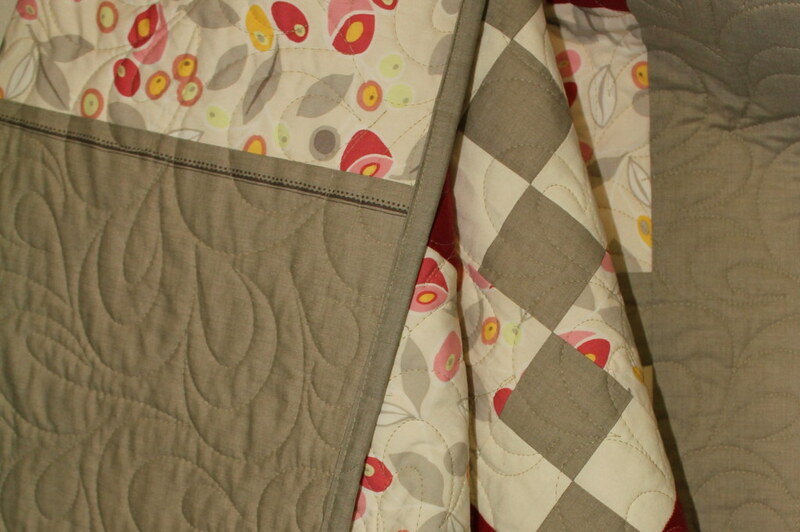 I am hoping with a little practice, I will be able to master quilting my own projects. Thank you for sharing! Thank you Kathy. Yes, I do my own quilting. I bought a HQ18 long arm about a year ago and still have much to learn. Practice is the key to gaining confidence; my confidence is slowly building but is not completely there!